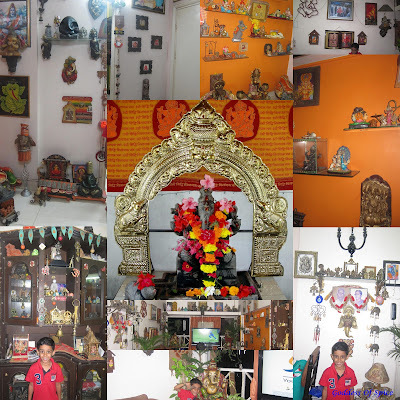 Ganesh Chaturthi has long gone by. Infact, even Navaratri just passed us by. So, it's high time I posted this recipe! As I mentioned in my last post, I make kozhakattai for neivedyam every year on Ganesh Chaturthi. After all, that's what Bappa loves to eat - right? Every year it used to be a hit or miss thing, mainly because the covering would either crack open or be a very thick layer. The reason for this was that I was using ready made rice flour just because I was too lazy to use soaked rice to make it! Finally, this year I decided that a well made kozhakattai is worth a little time and effort! And it worked! This year the kozhakattais were awesome and got consumed pretty fast. I usually make 3 kinds of kozhakattais - the sweet ones (vella kozhakattai), the savory ones (uppu kozhakattai) and the tiny roasted ones (ammini kozhakattai). I love all three of them and so does my husband. Its mainly just the former two kozhakattai that are usually made for neivedyam, and the left over dough from the outer covering is used to make ammini kozhakattai, but I love these so much that I make enough dough to ensure the making of the tiny kozhakattais. These make an excellent snack item. 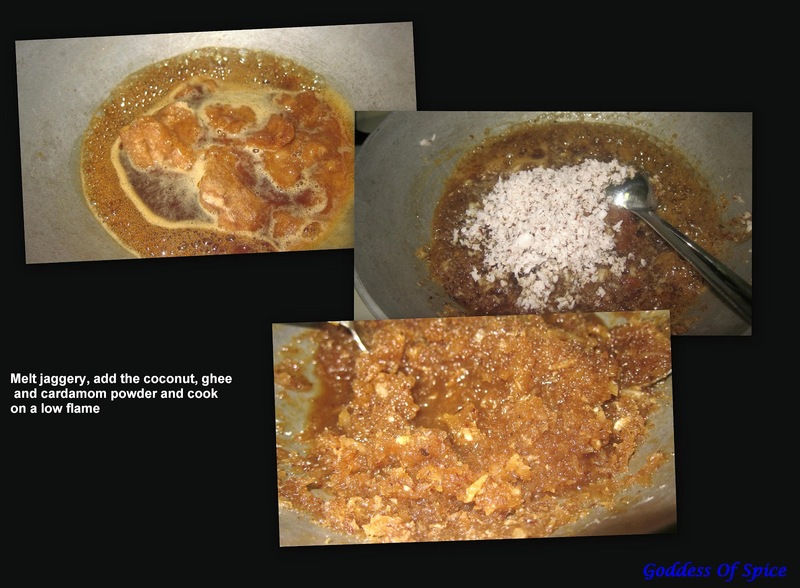 Making kozhakattais is not too difficult - it is just an elaborate and time consuming process. And the sad part is the rate of consumptions is inversely proportional to the time and effort put in! 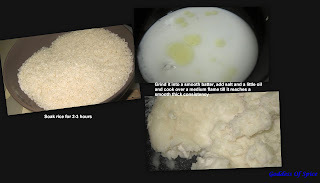 Rinse and soak rice in water for 2-3 hours. 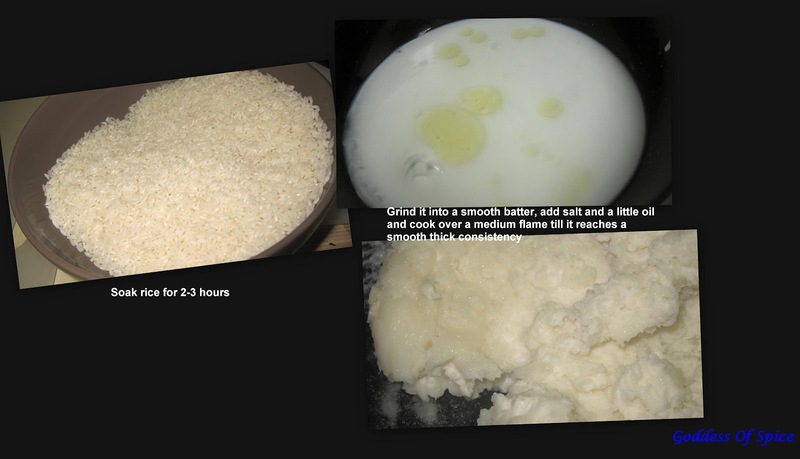 Grind it into a smooth batter adding sufficient water to make it into a smooth paste a little thicker than idli batter. To this batter add a tablespoon of oil and cook over a medium flame, stirring constantly till it thickens up to form a smooth dough. Now take it off the flame and cover it with a damp cloth/kitchen towel till it is ready to be used. The same dough is used for all three kozhakattais. Melt the jaggery, don't let it burn. 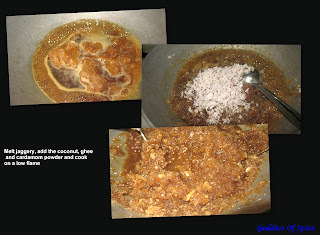 When the jaggery melts add in the grated coconut and cook stirring constantly. Once the mixture thickens enough to form balls, add the ghee and the cardamom powder and remove from the flame. After the filling cools enough to handle, make small balls out of it. Now, take a little bit of the dough for the covering, knead it well and make a small ball out of it. Using the tips of your fingers shape this ball into a small cup. Place a little amount of the sweet filling into this cup and shape them into modaks by pulling the ends together. Steam these kozhakattais in a cooker/idli steamer for about 10 minutes. Turn off the gas and wait for a couple of minutes before taking the kozhakattais out - if you try to pull them out immediately, they tend to crumble. Yummy kozhakattais are ready for neivedyam. Soak the urad dal and chana dal together for about an hour. Drain and grind them to a coarse mixture along with the green chillies, red chillies and salt. Roll these into balls and steam them in a cooker for about 10 minutes. Once they cool, crumble them and add the grated coconut, cilantro leaves, lemon juice and the tempering of mustard, asafoetida and curry leaves. Now take a small quantity of the covering dough, knead it well and place it inside a ziploc bag or between two plastic sheets. Use a round bowl to press it into a circular shape. Place this circular piece of dough in a mold, place some of the savory filling into each and seal the edges by closing the mold. 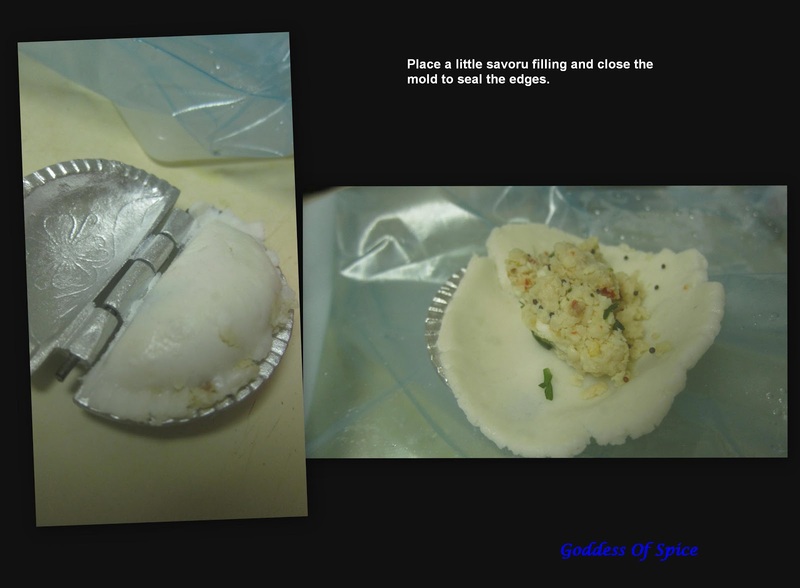 If you don't have a mold, then simple seal the edges with your fingers, to give the kozhakattai a semi-circular shape. You could use the back of a fork to crimp it's edges to make a design. Steam these in cooker/idli maker for about 10 minutes. Turn off the flame and wait a couple of minutes before removing the kozhakattais, otherwise they will crumble. Delicious uppu kozhakattais are ready to be served. 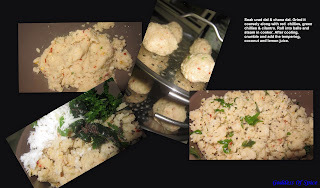 Roll the outer covering dough into tiny balls and steam them in an idli steamer/cooker. Heat oil in a pan and add mustard, urad dal, asafoetida, red chillies and curry leaves. Tasty and fun ammini kozhakattais are ready for munching.